After I finished "playing" in the snow.... That Iron Hill crew. Come rain, snow, sleet, blizzard....not even the mail got delivered here today. But, their annual Belgium Comes to West Chester event? From Thursday night on, Larry Horwitz left no doubt that it was going off today no matter what. Was there any reason to have to have this event today? No, not really. Should have anyone really risked life and limb (oh wait, that's at The Drafting Room) to get there? Of course not. Would a reschedule been more prudent. Maybe. It doesn't matter now. But, here's the thing. The roads, once you got out of your little nook of a driveway, cul-de-sac, or whatever, were really not that bad. Once you got into West Chester and found a spot in a parking garage you were doing okay. And once you got into Iron Hill, you were golden. 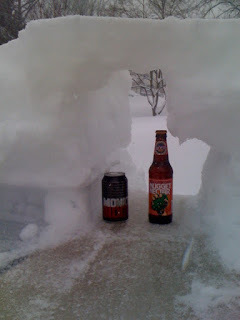 (and, for the record...it was 14 minutes from Malvern to West Chester...and 18 minutes on the return) It just so happens that enough people did take the opportunity to kick back with some great beers once they got the shoveling and digging and tunneling and sledding done today. Would've it been nice if more brewers and more brewery reps could have been there to hang out and talk shop? Sure. But, there were enough there...you might recognize some in the picture...that you couldn't walk a few steps without bumping into other customers, industry folk, or restaurant servers. It was crowded. And, it only got more so as the afternoon wore on. Speaking of crowds, out of all the fun talk, I overheard my quote of the day, maybe year so far. Guy to group as he entered: "Hey, what's up...I finally made it...great to see you all...how you doing?" Girl: "Not too bad, yeah...." Guy: "Wow, is it always like this?" Girl: "No, there's just some weird beer people here today for something...I dunno." The entire restaurant was dedicated to this event and the system that Iron Hill had set up for distributing flights/sampler trays was better than ever. All beers were available at once and with a walk-up table for people to choose samplers, the crush at the bar was virtually nonexistent. And the Brew Lounge wasn't too shabby either. I warned you didn't I? The brewhouse was converted into The Brew Lounge where VIPs (that was everyone, by the way) were invited to walk in and taste some of Larry and Jean's "super-secret beers." Granted, I didn't taste even half, even a third of all the beers that were available on the big menu. But, I'm guessing (and this is partly educated from asking others) my opinion that Du Armand was one of the best beers of the show is not all that out of the question. Ithaca's Le Bleu was neck-n-neck there as well. Du Armand. That'd be master brewer, distiller, blender Armand Debelder. His Drie Fonteinen brewhouse has recently gone dark; but the guys at Iron Hill have some of his special Brett strain working away in their own brewhouse and it was used in the making of this wonderfully low(er) alcohol, slightly young and Brett-y, mildly fruity beer. I lost count how many glasses of this tasty and refreshing delight that I had. At 5.5% ABV, I wish I had a growler of more at home with me. 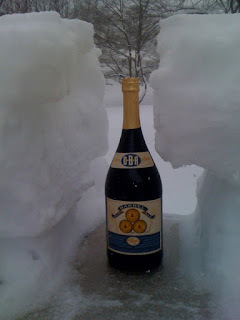 My only wish at this point is that we see some more of this beer. One full wooden barrel was made so it sounds like at least a couple of more halves will see the tap handle before all is said and done. And, speaking of done. I know that some of you might be hoping to stop in still tonight, tomorrow, or next weekend with the hope--the chance--that some of these wonderfully talented brewers' brews are still available. Weeelllllll... What can I say? I hear the Ironbound Ale is a decent beer too.